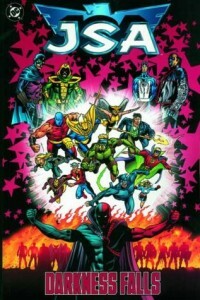 Had I read the previous JSA volume, Justice Be Done, before buying this one, I probably would have passed it by. As it was, I picked them both up from Half-Price Books, which should have given me something of a clue as to how much their previous owner enjoyed them. In my review of Justice Be Done, I laid the blame mostly on James Robinson, whose name is conspicuously absent from this volume, so I have to revise myself and look to David Goyer as the writer who created this mess. And a right mess it is. Having just saved the universe from one of Dr. Fate’s enemies, this time the big baddie is an Hourman arch-nemesis called Kobra who can be anywhere at anytime, and is looking to add omniscience and omnipotence to his omnipresence. In a way, the previous volume led to this, because with comics, as with soap operas, the next thing has to be bigger and badder than the last. All the same problems that existed in that volume are here in spades: characters that walk-on and -off with alacrity, instant accomodation to psyche-splitting events, references to characters and events that only the most scholarly of super-junkies could be assumed to remember. The only redeeming value to this is the ending, where Goyer lets slip a little bit of revenge fantasy that is less typical of superhero stories. As one character says to the revenge-meister, “You may live to regret that,” and that promise is the only reason why I’d be interested in the slightest in continuing to follow this series.